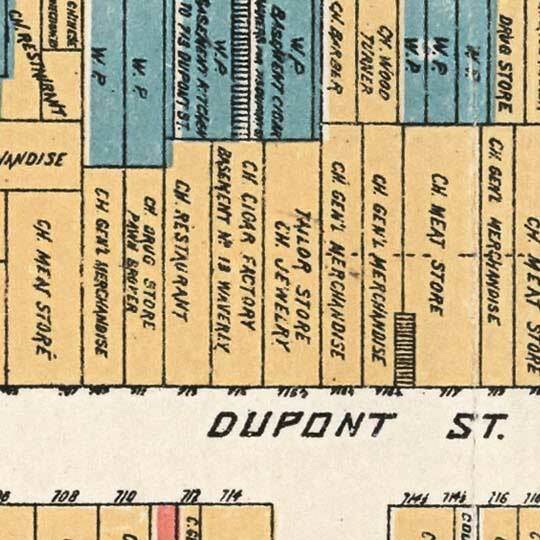 This map of (perceived) vice in San Francisco's Chinatown [gmap] is a fascinating historical document, as well as a rather cringe-inducing reminder of how overt the racial prejudice of the late 19th century was. This map is, stylistically, almost identical to the common fire insurance maps of the era, where different types fire hazards are color-coded. It has an almost identical feel; except this color coding suggests a different type of perceived danger -- that being every moral-panic "yellow peril" trope that the mapmaker could dream up. Thanks for posting this. I worked at Gray Line in San Francisco many years ago, and one of my co-workers had this map under the glass on his desk. I’ve been trying to find another one for years. Fascinating piece of San Francisco history! Well…if this Farwell fellow was racist…it would appear that he was “equal opportunity” in that respect.He does -afterall point out the places where white prostitution / vice was available. One of the main aspects of the “yellow peril” was the fear that the Chinese, with their vices and foreign ways, would corrupt Americans and insinuate them into the Chinese lifestyle. Fears of the appeal of Chinese vice, as well as the possibility of miscegenation, were rampant. White prostitution in Chinatown catered to whites as well as Chinese, but the fact that white brothels (that is, brothels with white prostitutes) existed fanned those sexual fears (and were actually worse than Chinese brothels, in that respect). The same thing happened later with blacks.